Instrumental Rock, a blend of 80s Metal and 70s Hardrock also offering some quiet pop tunes. 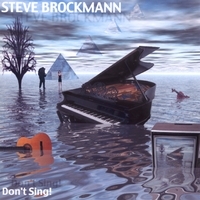 The title of e-guitarist Steve Brockmann's CD is programmatic. Don't Sing' was recorded as pure instrumental album specifically (and not amazingly) focusing on guitar work. Steve, who - with one exception - not only recorded all electric and acoustic guitars but also keyboards, bass, and percussions, excels as multiinstrumentalist virtuoso. His music is a composite of 80s Metal and 70s Hardrock, even offering some quiet pop tunes in addition to the hard tracks. Steve Brockmann, born 1965 near Hamburg, Germany, has played an active role in Northern Germany's music scene since the early 80s. Being the creative head of various bands, he played gigs on many stages between Germany's most popular holiday island Sylt up in the very North and the orchards of Lower Saxony. Among other, he played support gigs for rock legends such as Uriah Heep, Moody Marsden Band, and Hawkwind. After having spent some time roaming the North and living his Rock 'n' Roll road movie, today Steve mainly concentrates on the work on his various projects in his studio.